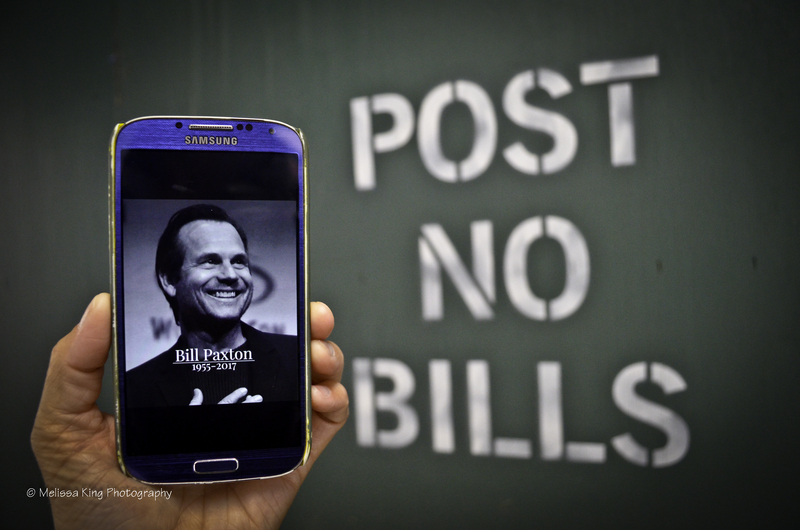 I never met Bill Paxton. And after years – decades, really – of watching his films, seeing him charm the hosts and audiences of late night TV talk shows, and soaking up every bit of information offered in this entertainment publication or that I felt like I had a pretty good handle on the attributes that made him who he was. And who he was… was a movie star, a family man, a story teller, a goof ball – and a simple guy with a genuine soul. All of the things I thought I knew were more than validated on Father’s Day 2017. I was invited to attend a tribute for Bill in Manhattan, at which the people who really knew him shared their memories of going to school with Bill, or rooming with Bill, or performing with Bill. And the words from those people who knew him in his “early years” shined a light on another aspect of who Bill was – a friend. They read poems and delivered prayers. They recited Shakespeare. They quoted Bill and a character or two from his movies. There was mention of “the third rail” and Bill’s fixation on that story and the specifics of way it was told. And for a brief moment, Bill was there. And there was laughter. We heard about Bill’s ability to make a “spectacular omelette.” The secret apparently lies in whipping the Dijon mustard just right. They told of the risks Bill took to produce forbidden performances in obscure places – on subway platforms or the rooftop tennis courts above the library (that’s a thing??) at New York University. We learned of a production of “One Flew Over the Cuckoo’s Nest” and the invention of the “Shoeshine” character. I listened as these friends and former roommates recalled meeting Bill and talked about their first impressions of him. Some were fascinated with him, some not-so-much – at first. There were descriptive tales of Bill’s unwavering confidence, and his Texas drawl, and his interest in the intricacies of people and things – and their history or what made them specifically unique. 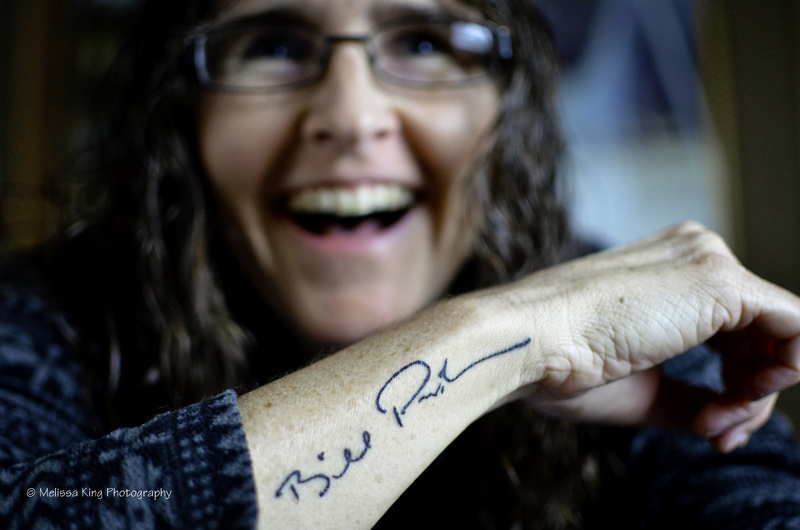 His friends talked at length about Bill’s passion for aesthetics and his enthusiasm for art. Again, it was Bill’s voice uttering those words. And again there was laughter. I didn’t just listen to these stories; I watched how they were told – with enthusiasm and fond remembrances. I observed their body language as each friend or family member spoke; there were grand gestures and tremendous smiles and looks off into the distance as details and emotions came flooding back. I saw the smiles on their faces and the tears in their eyes. I heard them laugh and sniffle and pause, their words and movements and gazes of reflection altogether revealing the adoration in their hearts. 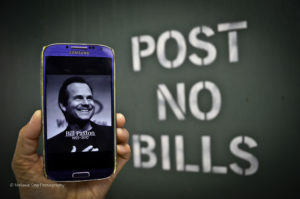 To them he wasn’t Bill Paxton, the actor; he was Bill Paxton, their friend. And then there was that video. Bill’s longtime friend and collaborator, Tom, put together a heartwarming collection of documentary footage of Bill with his dad, John. As it played out, the video morphed into a sort of memorial for Bill. Our laughter turned to tears. The movie clips and video snippets and personal photos and wistful piano all were beautifully combined in this visual poem detailing Bill’s “extraordinary life,” and the emptiness felt by everyone in that room was overwhelmingly realized. Later at Toad Hall, we all raised a glass to Bill. And it was there that I asked Bill’s friend Donal to tell me a “happy story about Bill.” Then I sat in wide-eyed delight as he walked me through the comprehensive and animated account of how Bill met the woman who later would become his wife. Donal is an insanely gifted storyteller. And I watched as the nostalgia of that tale brought a smile to his face, which in turn brought a smile to mine. I was beyond grateful to have spent time with these people who were so welcoming and willing to share their memories, so that I could better know the man whose movies were and are such a huge part of my life. And everyone who had anything to say that day gave this fan from Minnesota something to remember about this incredible man who clearly meant so much to so many. There’s no question that Bill Paxton was one of my absolute favorites. Learning more about him through his family and friends made me sense his absence on an even grander scale. But I also felt a connection that I hadn’t before, like I was no longer just a fan. I had learned more about Bill from those closest to him. Their memories of him had us laughing together and crying together. To think about all the lives touched by him and to understand the ways in which he touched them truly is its own reward. And that’s such a Bill thing. 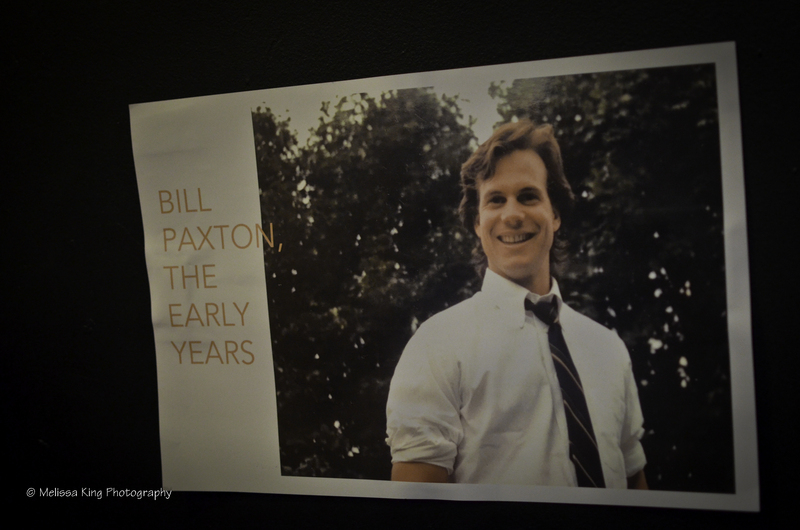 No, I never knew Bill Paxton. But I feel like I have a better and more personal idea of who he was – the story teller, the practical joker, the art enthusiast, the Hollywood actor who never forgot his roots, the dedicated family man, the lifelong friend. He will be remembered always. This was my first time in New York; I took the trip solely for this event. And being in that place on this day with these people was exactly where and when and with whom I needed to be. 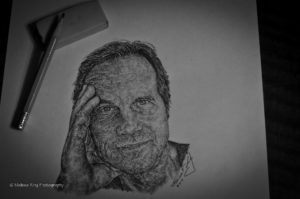 You have just enjoyed the insights of Movie Addict Mel, a Bill Paxton fan who wrote this post to recognize what would have been the actor’s 63rd birthday. Follow her on Twitter @movieaddictmel, and “like” her Facebook page www.facebook.com/movieaddictmel. You also can email her at movieaddictmel@outlook.com. Bill was meant to be in the hearts of so many !! Most of all to his family …. Mel, you always do a great job of letting your passion for film shine in your writing, but this takes it to the next level. Bill would be proud to call you a fan of his. You tell your story beautifully here. I cannot imagine what it must have been like to be at that tribute and so I thank you for this beautifully detailed description of your experience. This post put me in tears. I grew up watching Bill’s movies and consider him one of my all-time favorite actors. I attended the storm chaser memorial for him in Wakita in September 2017 and was overwhelmed by the stories told there about his kindness and playfulness. He was a true light in this world and we are a little worse off without him. A year later and I still can’t believe he is gone. Thank you again for this gorgeous post. I like this actor since The Terminator. Some of my cults movies are less fun now. This amazingly moving and thoughtfully written tribute to Bill Paxton allowed me to be a little bird sitting on your shoulder as you moved from admirer to fan to trusted friend. Not many people would be able to make that transition so smoothly and honestly as you have done. First trip to NYC and given the opportunity to become the vessel being filled with remembered memories from Bill’s family and friends, with whom you shared your own insights and joys. Then you emptied that brim-filled treasure with us, allowing all those emotions Bill gave us through the years through his talents in so many varied performances on the screen. Bill lives on through your choice of words, your instincts for the person he was, and you have touched our souls with your sharing. Thank you so much for making it real. Forever. Beautifully written, Mel. I’m so glad you came and documented your experience. And thanks for the drawing of Bill, which is hanging on my wall next to one Bill drew of Central Park. Keep the flame. thank YOU, Tom, for inviting me out to the tribute. i had no idea what a life-changing experience it would be and truly am grateful to have been a part of it. i hope i was able to capture the emotion of the day and that my words adequately expressed just how much i appreciated being there.